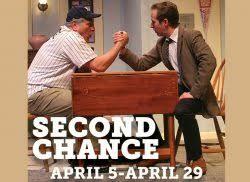 Seven Angels Theatre’s production of Second Chance is a heartwarming, poignant play about love, passion, regret and, of course, second chances. Although somewhat predictable, the play nevertheless drills down beyond the veneer of appearances, self-esteem, aging, and ultimately, one’s own mortality, and gets to the core of the reality of life. But the journey is far from depressing. Indeed, it is a bitingly humorous, inspiring celebration of being in the moment and enjoying life at any age. The play centers around a widower, senior curmudgeon who has, for all intents and purposes, given up on life, resigning himself to armchair umpiring of baseball games. When his surliness culminates in an unjustified mace attack upon an innocent delivery person, his dutiful attorney son, Larry, has no choice but to put him in a senior citizen, assisted living complex. Of course, half the battle is getting Jack, who always has been stubborn and set in his ways even when he was younger, to agree to try it out. Once he does, however, he realizes that while being of senior age may have some limits, life is not only worth living but rekindling passion and love is even possible. Jack turns out to be in hot demand by the fellow senior female residents – vixen Violet in particular – and a young Russian orderly named Malka who has the ability to see through the wrinkles of time and ferret out someone’s true nature which lies underneath. Without giving away any spoilers to the plot (although if you’ve seen the classic Grumpy Old Men, you can guess), Jack does get an opportunity for a second chance at bat. Although elegant in its simplicity, the play, like Shrek’s onion, has a lot of layers with several motifs. Second Chance is both a cautionary tale about the hazards of age stagnation and inactivity as well as a coming of age story for senior citizens. It also deals with elder care issues and the inevitable situation when parents return to their second childhoods and have to be cared for by their children. Having been a late baby for my parents and concerned about elder care issues growing up, and then finding my soulmate in the autumn (well, late summer) of my life, I found the tale truly relatable. The writing, direction and casting is spot on. 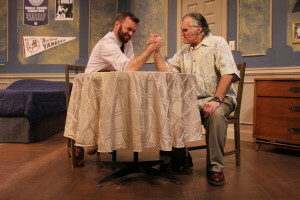 The playwright, Mike Vogel, has created real characters, not caricatures, whose emotions are aptly displayed via the tight direction by Russell Treyz and a brilliant cast. Stage and screen veteran Paul D’Amato is wonderful as Jack. The arc of his character from a possibly demented senior shut-in to a sunglass wearing, James Brow-like dancing maven is not only hysterical, but totally believable. Marina Re as the sultry senior Violet brings just the right amount of sass and brass to the role. Their chemistry together on stage is palpable (which may emanate from their off-stage relationship). Amanda Kristin Nichols is perfect as the vulnerable, somewhat naïve but good-hearted Malka, the younger woman who is blind to age, but not to human nature. Jack Lafferty is thoroughly charming as the dutifully loyal but frustrated son who ultimately learns that his father, like many parents, is not perfect, but did the best he could. Finally, Warren Kelley, whom Pillow Talking loved in Bye Bye Birdie and Attack of the Elvis Impersonators, is side-splittingly hysterical as the jealous, walker-wielding neighbor, Chet, who sees Jack as a threat to his self-perceived “harem” at the complex. I’m a huge proponent of second chances. At having another go-round. The take two. And why wouldn’t I be? It wasn’t so long ago that I met my soulmate (yes, I do believe they exist) after my first marriage in which I may have stayed just a tad too long…the folly of youth, countless excuses, even denial can contribute to these kinds of situations. Things go stale or can even be godawful, but many of us remain, whether it’s for the kids, for financial reasons, or just because we’re stuck and don’t know how to go about getting out. But having that second chance – meeting the right person – can be a soulful reawakening that makes everything finally seem right; and it’s truly never too late for such a cosmic do-over. That’s what playwright Mike Vogel tells us in his poignant dramedy Second Chance now playing at Seven Angels Theatre in Waterbury, CT. A twist on the typical coming-of-age tale in which one’s latter, golden years (as opposed to youth) become the fertile ground for psychological growth, self-awareness, and emotional maturity, Vogel’s story, which is expertly directed by Russel Treyz, introduces us to septuagenarian, Jack, and his doting but slightly neurotic son, Larry. Since the death of his mother, Larry has become increasingly concerned that his father is unable to properly attend to his own daily care. Jack is in denial, all the while missing medication dosages and overreacting to trivial situations (such as the doorbell announcing the arrival of food delivery). As is oft the case with aging parents, it becomes a challenge for their children to gently guide them toward adjustments in their living arrangements. For certain, it is no easy task for Larry with his frequently belligerent, mostly unyielding, and altogether crusty and cranky father. But it is not just Jack who needs a life nudge – Larry, too, needs his own wake-up call. He’s more like his father than he would care to admit; set in his ways and also in denial. The move for Dad from his studio apartment to assisted living allows for the two supposed grown-ups to get to know both themselves and each other as they never have before. Secrets are soon revealed and each must come to accept things about the other – things they may or may not have recognized but never addressed. Vogel brings these issues to the table (and often to the bed) with heaps of humor and sensitivity, addressing issues of family, acceptance, and ageism with quick dialogue and sharp wit. No stranger to stage, screen, and TV, Paul D’Amato is perfection as the cantankerous Jack. He’s the guy who never looked past his little world to discover the wonders beyond – but when forced to do so, he was tickled to learn what he’d been missing. And what that was is embodied in the energetic, unconventional force of nature known as Violet – as spectacular as the color and as flirty as the flower’s scent, actor Marina Re is fabulous. D’Amato and Re have incredible chemistry – she’s the yin to his yang and vice versa. And while one may wonder how two actors can make this appear so authentic, you’ll not have to as the two are together in real life. Also delivering a powerful performance is Jack Lafferty as Larry, whose character’s layers also are peeled away. He and D’Amato bat quips back and forth with nearly the same intensity as two boxers in the ring. And rounding out the cast are two others from the new retirement home – the incredible Warren Kelley whom we’ve seen in numerous productions including the iconic Bye Bye Birdie at Goodspeed Opera House and the Off-Broadway musical Attack of the Elvis Impersonators. Kelley plays Chet, an obnoxious walker-dependent, advice-doling, back massage-hustling resident with the hots for the ladies, and the delusions that they are also hot for him. And last but certainly not least is Amanda Kristin Nichols as Malka (and the voice of another unseen resident named Blanche). She’s the Russian retirement home worker with the heart of gold and a penchant for the father/grandfatherly types – at least for those who give her attention or money for her young son. Shout outs must go to Daniel Husvar for scenic design; Doug Harry for lighting design; Johnna Fettinger for costume design; Matt Martin for sound design; Kimberly Jackson for props design; Stephanie Gordner as Production Manager; and T. Rick Jones as Stage Manager. As always, every part comes together in creating the dynamic whole. 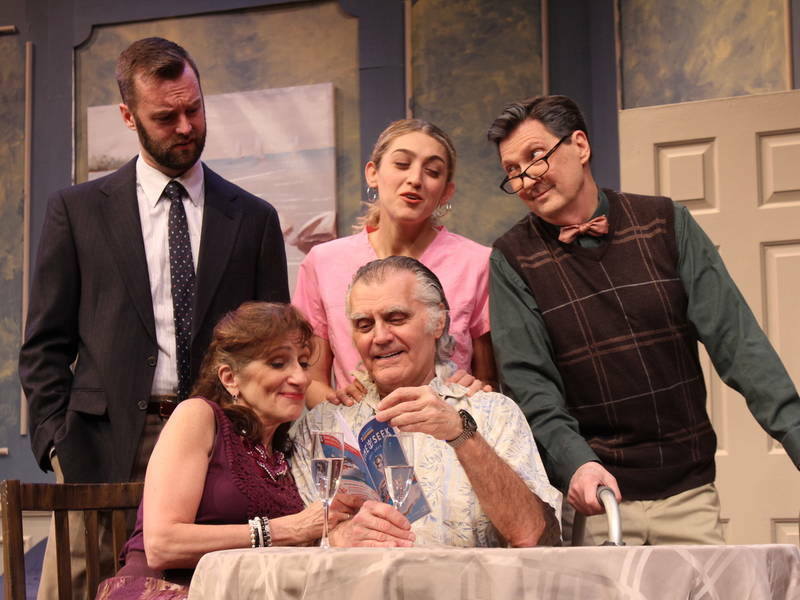 This is a play well-suited for the mature as well as for members of the “sandwich generation” – those who know how it is to be faced with making decisions or caring for aging parents. Vogel effortlessly navigates these potentially choppy waters while humorously debunking stereotypes about the elderly. It is a heartwarming must see!